What a month for the British sporting scene: With the Olympics starting in London in just a little more than a week, a pair of British cyclists are about to be crowned as the best in the world. In today's Stage 17 of the Tour de France, the final day in the Pyrenees, yellow-jersey holder Bradley Wiggins and his Team Sky compatriot, Chris Froome, proved beyond question that they deserve to finish this Tour de France one-two, taking home England's first title in the history of the storied race. Working together climbing four mountains, some through heavy mist, they crushed all but one rider, Spain's Alejandro Valverde, who'd broken away from the peloton early and managed to stay out front to win the stage by just nineteen seconds. In the process, the British duo gain another seventeen seconds over feisty Italian rider Vincenzo Nibali in third place. Saturday's Stage 19 individual time trial is the only remaining chance for an upset to the overall standings. But judging from the previous ITT in Stage 9, when Wiggins and Froome also finished one-two, 35 seconds apart and some two minutes ahead of Nibali, this victory is all but officially locked up. But what's made this year's Tour de France so exciting won't be obvious when Wiggins tops the podium in Paris. What we've seen time and again throughout the mountain stages has been a clearly very strong Froome holding back to help his team leader Wiggins. Froome's job as a domestique is to assist Wiggins, pure and simple, and he's been a team player. But he hasn't been shy about declaring his efforts to be "a very, very great sacrifice." As he told the French paper L'Equipe, "I could win this Tour, but not at Sky. It's difficult, but it's my job." Keep in mind, though, that Froome has not just aided the dominance of Team Sky, but benefited from it. Could he have won if he'd been the leader of a different, lesser team? Wiggins leads Froome by two minutes and five seconds, but a minute and 25 seconds of that are due to Froome getting a flat tire near the end of the first road stage of the Tour and not being able to catch up in time. Had that not happened, they'd be 40 seconds apart, all of which Wiggins earned by being a superior time trialist. Could Froome have made up with he lacks in time trials by slaughtering Wiggins in the mountains? We'll never know. We've seen such rivalries within teams before, when the up-and-comer has had to sacrifice his own ambitions so his elder teammate can win, most notably young Greg LeMond going up against his aging teammate Bernard Hinault in 1986 (LeMond won that Tour, but not without Hinault constantly attacking and trying to grind him into the ground). And then there's Jan Ullrich beating his teammate (and then-defending champ) Bjarne Riis in 1997. In both those cases, the younger guy won. But this time around, the younger guy has kept his ambitions in check, and in this case, the older guy a) isn't that much older and b) has been plenty strong himself. 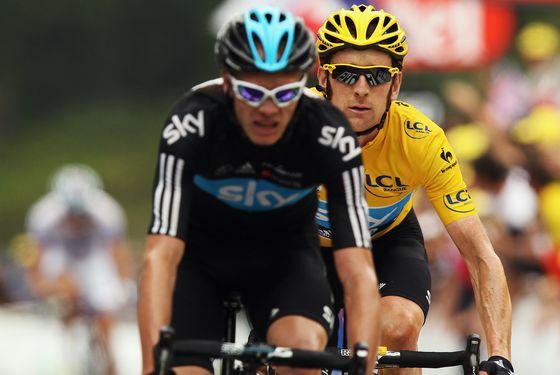 Wiggins has vowed he'll help Froome win another year if they're on the same team. Imagine Froome's frustration, though. He finally figured out he's had a undiagnosed parasitic infection that's accounted for his performance suffering in previous years, and now that he's feeling better, he can't let it rip. Worse, he and Wiggins went through this same thing nine months ago during the Vuelta a España, when Froome started off as a Wiggins's domestique but was given free reign on several mountain stages, gaining time on Wiggins, and came in second in the ITT, 23 seconds ahead of Wiggins. He finished 1:26 ahead of Wiggins and just thirteen seconds behind the winner, Juan José Cobo. Was that another case of something he could have won but didn't because of helping Wiggins earlier in the race? There's very little chance Froome will stay on Team Sky, which will be dedicated next year to defending Wiggins's title. Meanwhile, Frank Schleck (brother of Andy) left the Tour amidst controversy for testing positive for a banned diuretic that is used in sport to flush out evidence of performance-enhancing substances prior to a drug test. And in the other rivalry between a younger teammate and his elder-statesman leader, 23-year-old American Tejay Van Garderen of BMC Racing was given the green light to ride away from defending champ Cadel Evans. In yesterday's Stage 16, Evans struggled hard (he apparently has a stomach virus) and finished a full five minutes behind the Wiggins group, dropping behind Van Garderen into sixth place. At 9:57 back in the overall standings, Evans has no hope of a podium finish (though at 8:30 back, neither does Van Garderen), so instead the team's focus has shifted to securing Van Garderen's white jersey for the best young rider. He's one to watch, as is crazy French climber Thibaut Pinot, the youngest rider in the Tour, who won Stage 8, finished fourth today, and came very close to winning other stages. While the individual time trial on Saturday should be interesting, don't expect much to change. But what's going to be really intriguing is seeing all of these guys go up against each other in the Olympics. Wiggins, Froome, Van Garderen, and Evans will all be competing against each other in the men's individual time trial and the men's road race. Wiggins has won six Olympic medals, but all in track cycling, and is the reigning gold medalist in the men's individual pursuit, an event the IOC has eliminated. And Evans's team doctor says he'll be over his stomach bug and peaking just in time for London. Will the best of the Tour be too fried to compete? Or will they have enough left in the tank for a very different kind of race — where they're beholden only to themselves and their countries, with no team loyalties or sponsorship deals in play? You want to know who deserves to be team leader, or whether cycling's next generation really is better than the current reigning one? That's when you'll get your answers.